A crate is a safe spot that belongs only to your puppy. We recommend that while in training any time your puppy is not being closely supervised they are in their crate. 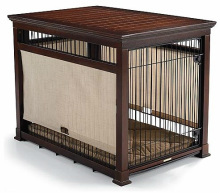 Your puppy should always have a safe and quiet place for their crate. A crate should be big enough to allow your puppy to comfortably sit, stand, and turn around. We recommend having your puppy sleep in their crate overnight. This allows them to better transition to house and potty training. Most wire crates can be purchased with a divider. This allows you to buy a crate that will suit your adult dog, but can be made into smaller sections the right size for your puppy. Having too large a crate space allows the puppy to think they can use it for a bathroom as well as a sleeping space at the other end! Water and food should not typically be present in your puppy’s crate, as eating stimulates their digestive system and will set you back in house training (there are exceptions of course, such as a small dish of water on a hot day or during a long absence). Please take your pet outside immediately before and after being in their crate to help establish potty training routines. Make your crate a comfortable environment for your puppy. Soft blankets or a crate pad is a great idea for your puppy to cuddle up and sleep. A soft toy and a couple of yummy chews in a Kong will make crate time seem like a reward for your puppy. Covering your crate or adding a heating pack (or even an old sweater warmed up in the dryer) may help your puppy transition on their first nights away from their litter. ​Practice crating for short intervals during the day, even when you are home, to build independence and confident crating. Please remember to remove your dog's collar before crating to prevent it catching on the crate bars or door.